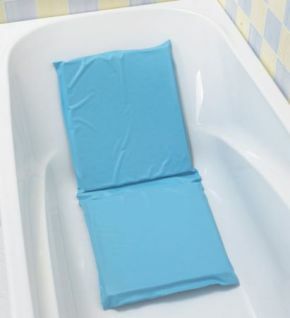 Bath Cushion and Backrest, Soft, Non Slip, Waterproof. A soft, non-slip bath cushion designed to make bathing a safe and comfortable experience. The foam inner is fully sealed in the waterproof outer, making it easy to clean and disinfect with normal cleaning agents. The cushion has suckers on the underside to keep it securely in place and allow quick installation and removal. Too early to say as it is a Christmas present for my wife who keeps slipping in our conical bath. Having unpacked it looks simple enough and potentially the right solution. It is doing the job for which I ordered it, just and with a lot of care. As the bottom of the bath is concave the suckers do not attach firmly, making it a risky business to rely on it.